The Best Strawberries are the ones you pick yourself. NOTE: You can stop the news ticker by mousing over it. 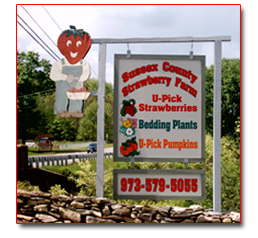 Sussex County Strawberry Farm, located in northern New Jersey, consists of two families who have been growing quality fruit for over 30 years. Not only are we growing berries, but we're growing a reputation for having the best berries. Our Farm takes pride in offering quality produce in a friendly, family environment. We look forward to seeing you soon! 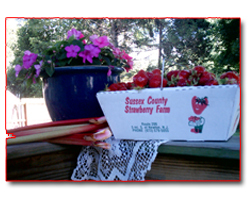 For Current Picking Conditions and times Call 973-579-5055 or click here. "We are bound by a small, sometimes magical fruit called the strawberry. This fruit has the power to make tears dry up, make friends with enemies, make sick people feel better, make the elderly feel younger by bringing back pleasant memories of days gone by, make acquaintances of strangers, and above all make little children smile. What other fruit has that power?"